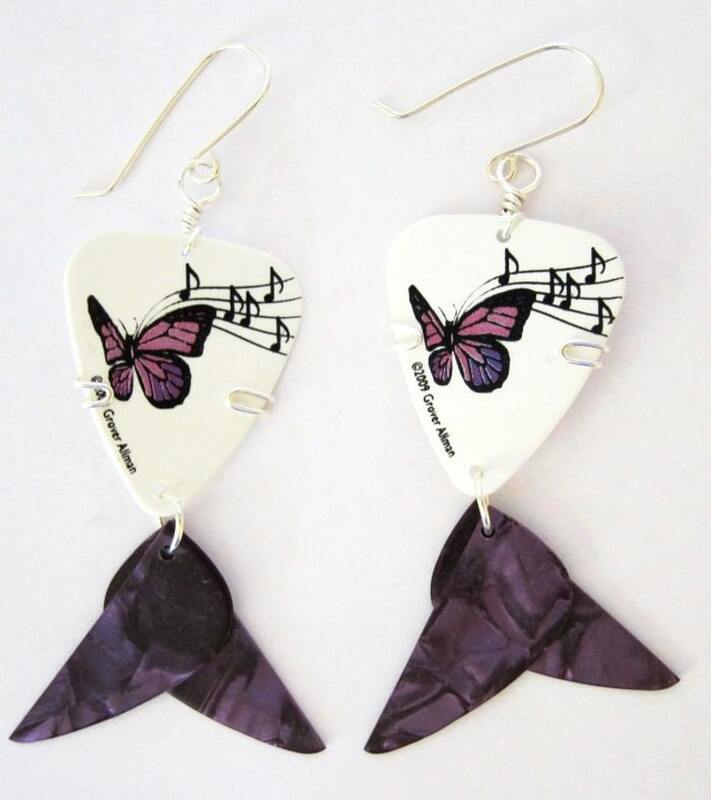 Let these musical butterfly guitar picks flutter around your ears. These picks are made with authentic guitar picks. The earrings hang about 3 inchs and are extremly light weight. They will not weigh down your ears. All of our earring wires are made out of sterling silver so they are hypo-allergenic. It was intended for my 22 year old son who plays the guitar and loves necklaces. It was however a bit too dainty for his personality... too bad for him, I would have to keep it for myself. I love the beads but did not realize they would be that small thus making the necklace dainty looking. I might need to separate necklace and pendant as much as I like crosses I do not like this particular effect as I do not play the guitar. I am a bit dissappointed but not the seller's fault. My daughter LOVES it! Thank you! We accept Paypal and Credit Cards for payment. If you pay with an E-check on Paypal it takes up to 7 business days for that check to clear. We will not ship any order until the check is cleared. In the state of Florida there is a 7% tax on any purchase. We do our best to make our customers happy with their purchase. If for any reason you are not satisfied please do not hesitate to contact us in email or through convo and we will do everything we can to make you happy. We are not responsible for any damage caused while in transit with the USPS and we will not offer refunds for this. We do not offer a refund on any custom orders, that includes personalized guitar picks and custom beading work. Due to the nature of what we do many of our pieces are one of a kind. If for some reason you are not happy with your purchase we refund the PURCHASE price once the item is received back to us undamaged. We will not refund the shipping cost and return shipping is the buyers responsibility. You will receive a tracking number in an email once your order has shipped. All shipments are insured through UPS and is reflected in the price. We ship with the United States Postal Service (USPS) using first class mail in the US. We also use USPS for all international orders. **Once your order has been shipped we are not responsible for the USPS. If your package is lost once you have received your tracking number of if you provide the wrong address at check out any reshipping will be at the buyers expense. 'PLEASE NOTE: All pieces are created by hand, so no two items are identical. That's the beauty of the product! Please allow for slight variances from what is shown in the made to order photos.'"